jewelry | ... And Show Your Work! 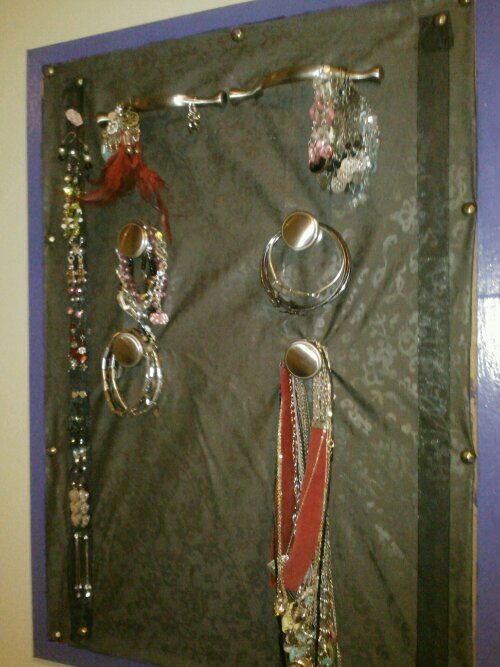 Inspired by this post I found via Hometalk, which in turn was linked from Pinterest, I decided to make myself an updated jewelry organizer/ storage device. I have very little dresser space (since I share my dresser with my girlfriend) and a very tiny bedroom, so something that could hang was ideal.But, I wasn’t happy with the burlap, and I wanted to use as much stuff that I had at home as I could. After the edge was dry, I tacked a piece of scrap fabric (edges folded under) to the cork part of the board. Both the decorative tacks and the fabric were things I had laying around from other projects. Then, I had to actually buy some things: hardware. I bought handles and knobs from the hardware section of Wal-mart, and screwed them through the corkboard. As you can see, the knobs are for bracelets and necklaces. and the handles are for French hook earrings. Improving (in my opinion) over the original design, I also added scrap ribbon to either side to put post-back earrings on. In all, this project cost me $15.00 for the hardware, and may still cost me about $5 for another set of knobs (because I have too many bracelets!). I could have saved money if I had gone to a hardware store and gotten less expensive hardware. (For example, similar pieces would have cost me between $6-12 at Lowes or Home Depot, according to website prices). 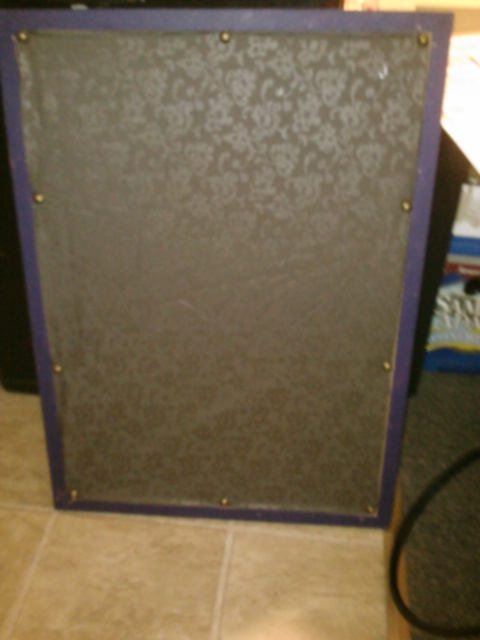 However, the corkboard new was a little pricey, so the project could have cost me more, too. The only drawback to this jewelry “box” is there is no place for rings. 1. 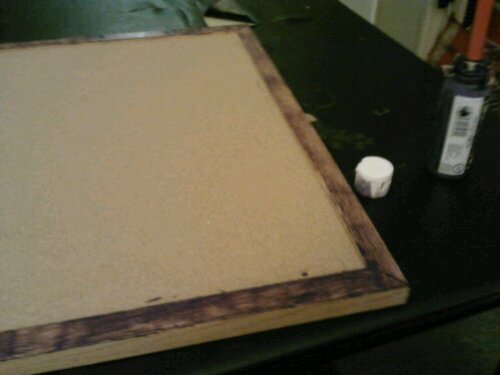 Paint edge of cork board and let dry. 3. Screw handles and knobs through cork board in desired configuration based on your needs. 4. Add ribbon with tacks. 5. Hang and load with jewelry!